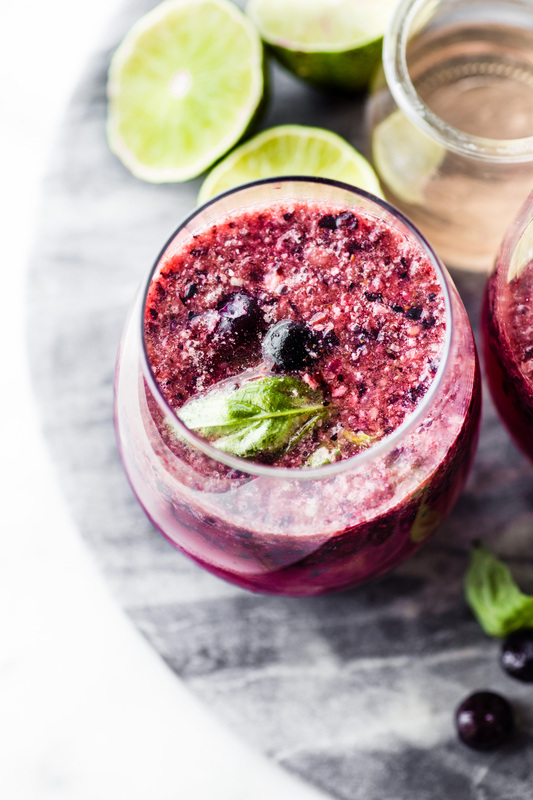 Wine Slushies may be an adults only version of a Slurpee, but this Berry Frosé recipe is lighter, more sophisticated, and BLISSFULLY delicious! 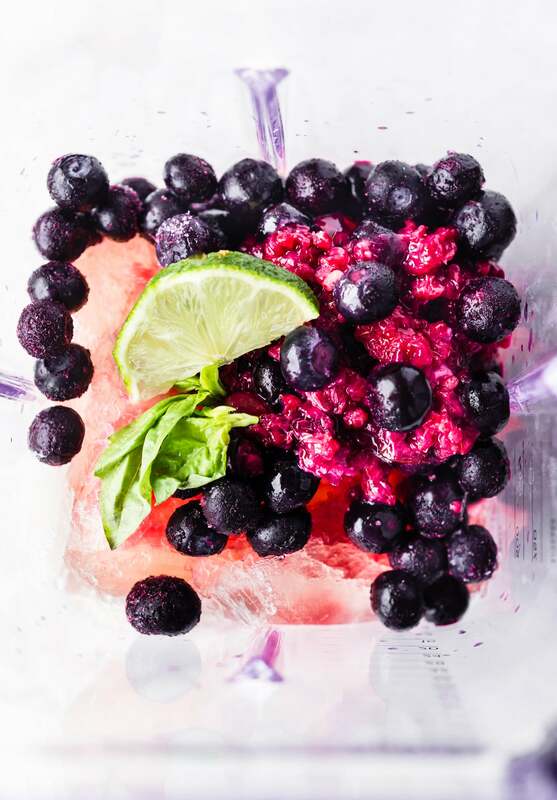 Triple Berry Frosé (aka Frozen Rosé wine) wine slushie is blended with fruit, fresh juice, and a hint of basil, creating a fun and refreshing summer cocktail! Let me tell the story of how this whole frosé/wine slushies recipe came about and my love story for Rosé. Mmm k? You see, the first time I had a glass of Rosé wine was in New Zealand. It was 2007 and we were there visiting family and friends. I remember it like yesterday (gosh I wish it was yesterday). The Kiwi (aka my husband) childhood friend owned a winery new Queenstown. We hopped in for a visit and took a tour. That’s also the time I fell in love with wineries and the whole geeky science behind it. Anyway, back to the visit. Yes, this winery (Gibbston Winery) served us the most amazing tasting Rose I’ve ever had. Nothing else has come close to it since. REALLY! And i’ve tried several. But here’s the kinda funny, yet kinda awkward story about this AMAZING Rose wine. You see, right before we sampled the Rose, the sommelier (the wine guide) told us something. He explained just how this Rose would taste. You ready for it? His words –> ” This wine is like kissing Scarlett Johansen, soft yet voluptuous” And that, my friends, will forever be engraved in my head. I hope I don’t meet Scarlett Johansen some day. I just might try to kiss her. LOL! Okay okay, back to the whole reason I am chatting about Rose today. Rosé wine, frozen, then blended with fresh berries, honey, and basil. This creation is what I call a BERRY BLISS FROZE COCKTAIL!! So what is a froze cocktail? Oh it’s heavenly Frozen Rosé. 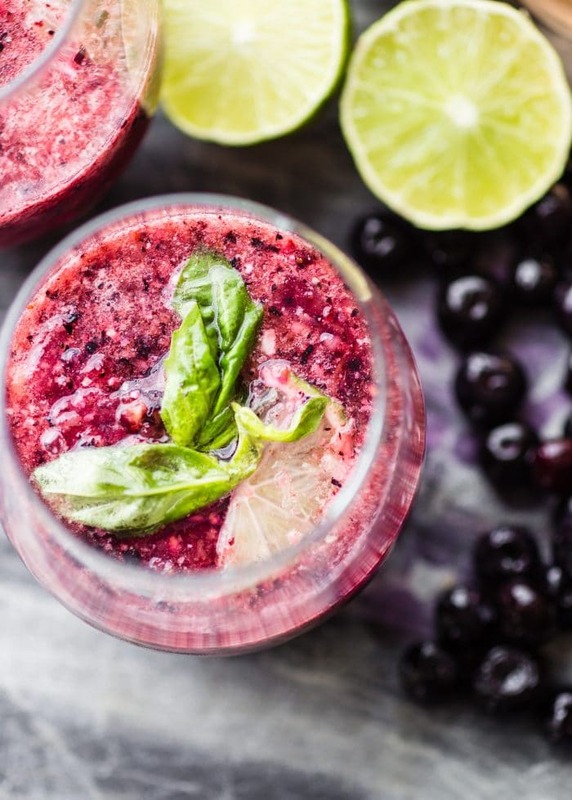 A frosty, pink (or in my case Berry Superfood PURPLE) fun drink cocktail. Basically the “coolest frozen rosé cocktail” for those warm months! Think of it as sophisticated wine slushy. And yes, Summer is COMING, so wine slushies are totally allowed! Most Frosé uses some time of simple fruit syrup along with the rose, but I really wanted to try to avoid the white sugar and go more “au naturale“. Today we’re keeping this Frosé light and fresh with addition of frozen and fresh berries. Plus more “BLISSFULLY” naturally sweet ingredients you all find out below. Oh and sparkling flavored water. Yup! La Croix, Froze, and berries = BLISS! Now you see what I meant? 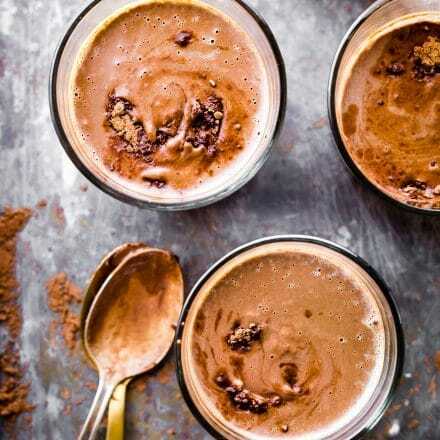 Here’s what you need to make these lusciously delicious wine slushies. Raspberries soaked in orange juice —> BLISS! Maple Syrup, Honey, or agave syrup. A small square container. NO ICE TRAYS. Trust me on that! And friends you can share it with. Yes, that’s a must! The other trick for making these Frosé wine slushies is the SLUSH part. Ice trays make it too frozen. You want it to be able to break up easily and then blend. Not like a smoothie. Ya know? I actually used a tupperware container. Then all I had to do was loosen the bottom after freezing for 6 hrs. Thanks to Bon Appetit for that little Frosé making tip. Okay okay, so now you know how to make one. If you are a wine lover like me, you will lvoe this! And to be honest, I am not a huge “cocktail” type of person (unless it’s a wine cocktail). But this… this my friends.. is BLISS. 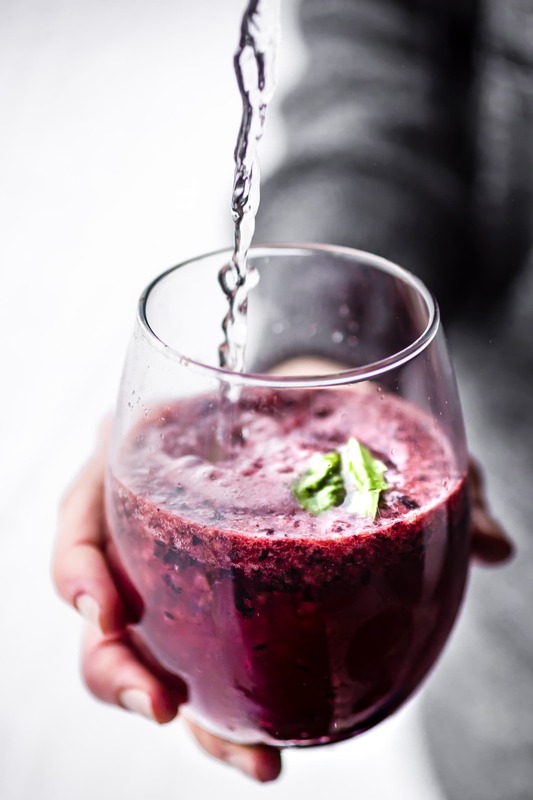 It’s refreshing, light, not too sweet, and in my world –> HEALTHY. 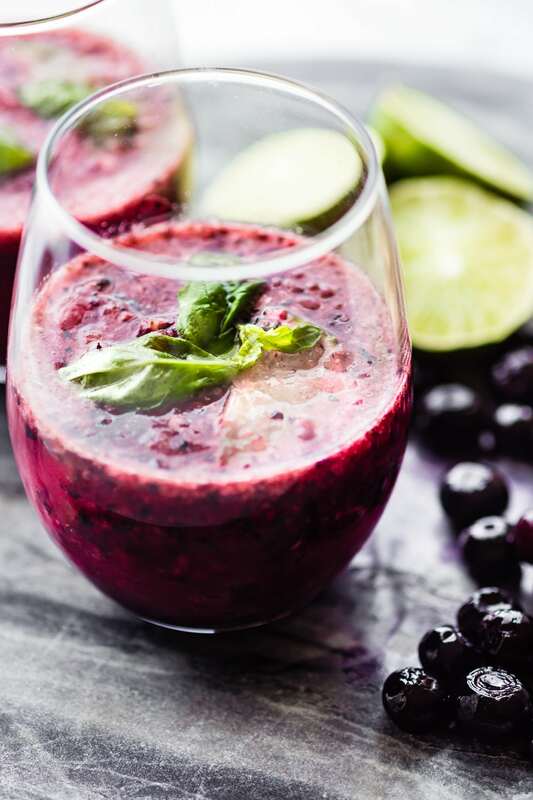 An adults only version of a Slurpee, but this Berry Frosé recipe is lighter, more sophisticated, and BLISSFULLY delicious! 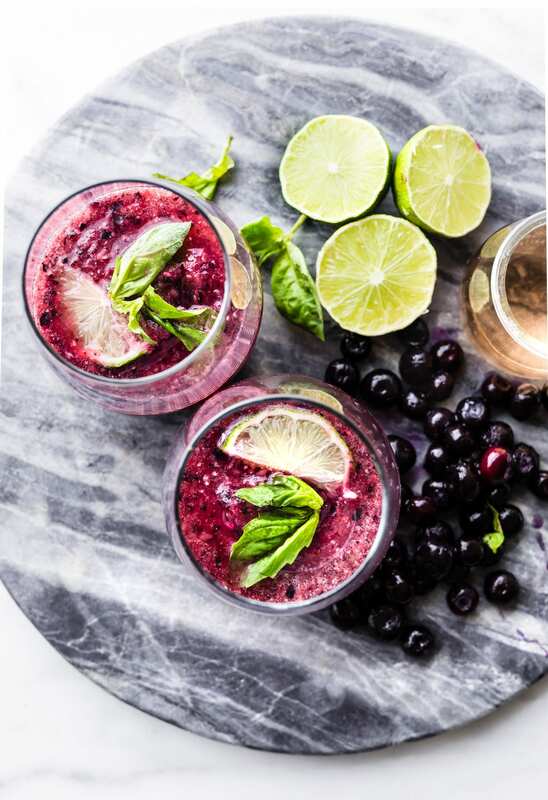 Triple Berry Frosé (aka Frozen Rosé wine) wine slushie is blended with fruit, fresh juice, and a hint of basil, creating a fun and refreshing summer cocktail! Pour 1/2 bottle of Rosé in a square or glass container. The more wine you use, the less sweet it is. It will also be thicker. Place in freezer for 6 to 10 hrs. While the Rosé is freezing, soak your raspberries in the orange juice for 30 min – 1 hour. Then mash or puree them together. Keep in fridge until ready to blend. Once the Rosé is frozen (note it will still be “icy”), scrape into a blender. 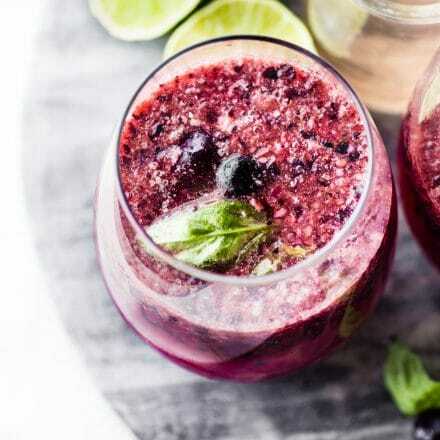 Add your lime juice, frozen berries, raspberries soaked in orange juice, maple syrup, 1 basil leaf, and optional vodka. Pulse until blender and smooth. Place the blender back into freezer to chill for another 30 minutes (see notes if time constrained). Remove from freezer and pulse again until slushy. Pour into 4 serving glasses. Add optional splash of sparkling berry water to make fizz on top. Garnish with lime wedge, berries, and basil leaf. You can skip the extra freezer time once blended, but frosé slushy will not be as thick. So let’s raise a glass to Scarlett Johansen and CHEERS! Stay thirsty my friends. No really! p.s if you want a MOCKTAIL version, just use white grape juice instead of wine. Or even grapefruit juice. Totally works! Please tell me you’ve had rosé! If you are over 21 that is. 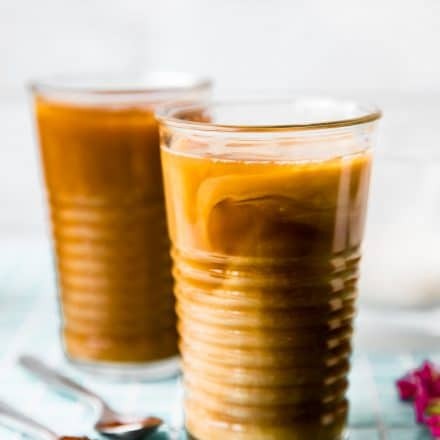 Favorite warm weather drink? And …. go! This looks just insanely yummy and healthy, thank you! I have had rose actually long time ago. Most wines give me horrible headaches but maybe if I have it in slushie form that won’t happen? ONE can always hope! Oh girllll this is perfect and a must-make for summer! WILL be trying this one out for sure. go for it! i think you will LOOOOOVE! Just saved this recipe!! 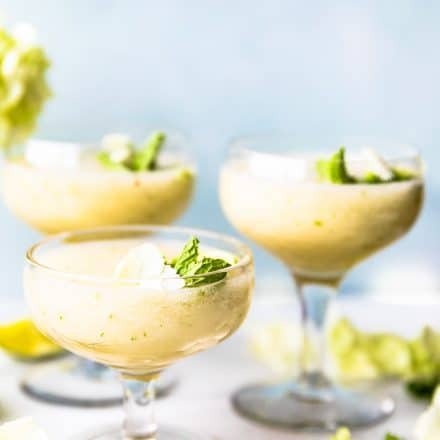 Totally up my alley and delicious for summer!! I’m making a renewed effort to create a bit of indulgent time in my life to read blogs I love, and this post was such a great way to dive in! The photography is just outstanding (oh my gosh – that pouring shot! ), your story about Scarlet Johansen is HILARIOUS, and I pretty much just want this slushie in my life all.summer.long! Plus, I love that you offer optional upgrades (ahem … vodka LOL! ), and a mocktail non-alcoholic version, too – so flexible for any party, any occasion! I am 100% pinning this because I’m dying to make it ASAP! haha yes! I love all the options too. Just means we can drink more, yes? with scarlet. LOL! Brother. You have REALLY outdone yourself this time. I’ll be keeping this in my freezer all summer. Lawd… I love me some rose. I’m sure kissing Scarlet Johansen is quite nice too… HAHAHA! What a beautiful cocktail slushy! Your photographs are stunning and the recipe looks amazing. I could definitely get into one of these wine slushies like Right now. 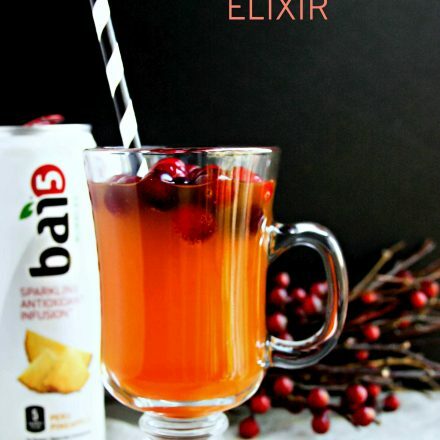 Sounds so refreshing and like the perfect summer cocktail and since I’m a wine drinker I know I’m gone love this! i have just started drinking rose and i love it for my afternoon drink. i need to get on a frose train. I love everything about this slushie! We’ve fallen in love with Rosé the last couple of years and a Frosé would just impress my girly friends too. Wine and blueberries just think of those antioxidants too! of course! Mocktails are fun too. Try it with grapefuit juice or white grapefruit juice. YUM! Sounds excellent, love the color! Looking forward to trying this one out! I kinda wish I liked wine now. Seriously why do you not live closer to me?! This just bordering on cruelty now.